Okazaki Canal (Okazaki Sosui) is a part of Lake Biwa Canal, the canal that to this day brings water to Kyoto from Lake Biwa. The most famous part of this canal is, of course, the aqueduct at Nanzen-ji Temple, but the most beautiful one during the cherry blossom season has to be Okazaki Canal. It will be nice experience to ride a beautiful Japanese boat on the Okazaki Canal. It is a spring feature of Kyoto. 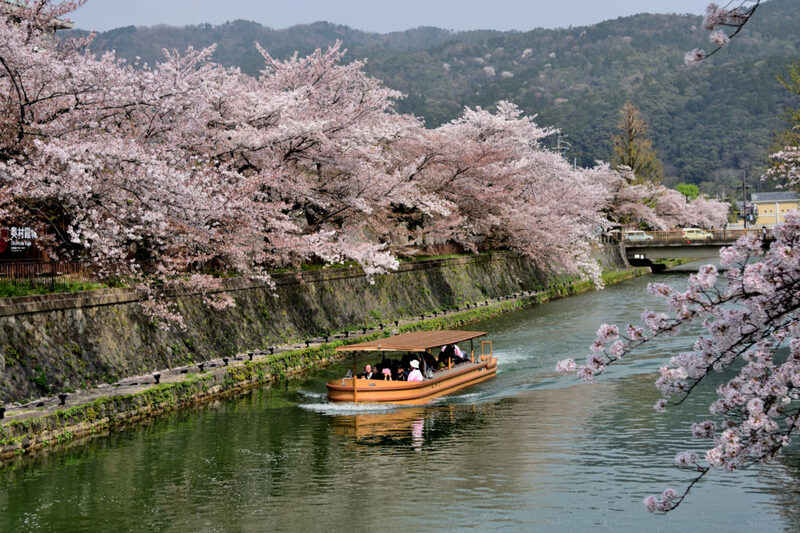 These boats offer an incredible view of the cherry trees, and the boat ride is especially spectacular at night when the cherry blossoms are illuminated. These traditional Jikkokubune boats tour will be recommended. Heian Jingu Shrine created by Kyoto citizens' passion for Kyoto revival. Heian Jingu Shrine is located in the middle of Kyoto Imperial Palace and Nanzenji Temple. It is a shrine with a large site, and it is also a tourist course called "Kyoto Five-City Tour" around Heian Shrine. Heian Jingu Shrine was built in the Meiji period and will be a new shrine in Kyoto. It is a Shinto shrine with a short history in Kyoto, but it can also be said that this shrine has a different beauty from other temples and shrines. There are many modern buildings in the precincts that can not be seen in other temples and shrines. The shrine holds one of the biggest torii gate in Japan and the site includes the bright red main hall, pond and Japanese garden. It is no exaggeration to say that the large “Torii” gate at the entrance and the huge lacquered shrine that can be found on a vast site is a representative of Kyoto. It was the people of Kyoto who built Heian Jingu Shrine. The capital was moved to Tokyo by the Meiji Restoration. It can be said to be a building created by the citizens' passion for Kyoto revival. The cherry blossoms of Heian Jingu Shrine are full bloom of about 20 kinds and 300 trees including Somei Yoshino including weeping cherry trees (beni shidare). The point you'd like to see is "Nanjin-en" where "Yaebei Sidarezakura" blooms as soon as you enter from the west corridor. As the great collaboration view of flowers and the historical temple can be captured, it is considered as one of the best spots to see weeping cherry trees in Kyoto. The blooming time of weeping cherry trees is usually later than other cherry trees such as Somei Yoshino so you can still enjoy them if you slightly miss the main viewing season. In the spring cherry blossom season　（Usually at the beginning of April）, a "red weeping concert" is held. You can listen the music performances like Cello, Ocarina, guitar, court music and other instruments while watching the lighted up weeping cherry trees. It is a recommended event for people who want to see the night cherry blossoms that are different from usual. 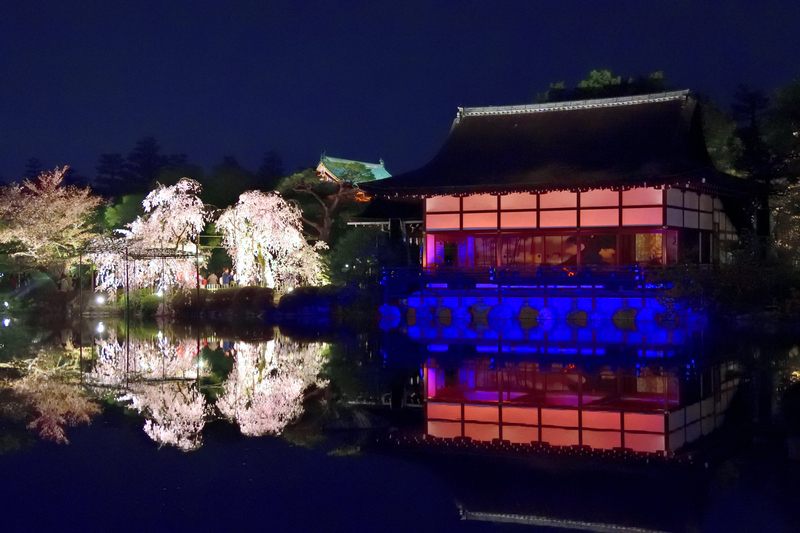 During those days, light up of the weeping cherry blossoms can be seen from 18:15 to 21:00.